Cervical polyps are benign growths protruding from the inner surface of the cervix. They are typically asymptomatic, but a very small minority can undergo malignant change. They are estimated to be present in 2-5% of women. In this article, we shall look at the clinical features, investigations and management of cervical polyps. Cervical polyps develop as a result of focal hyperplasia of the columnar epithelium of the endocervix. They are more common in multigravidae, with a peak in incidence between 50 and 60 years of age. Fig 1 – Normal columnar epithelium of the cervix. 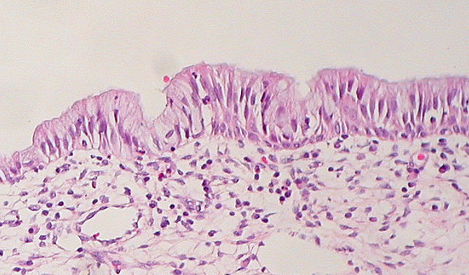 Cervical polyps result from focal hyperplasia of this epithelial layer. Cervical polyps are often asymptomatic, identified only via routine cervical screening. If symptomatic, the most common clinical feature is that of abnormal vaginal bleeding. This can be in the form of menorrhagia, or intermenstrual, post-coital, or post-menopausal bleeding. Polyps can also cause increased vaginal discharge. Rarely, they grow large enough to block the cervical canal, causing infertility. On speculum examination, cervical polyps are usually visible as polypoid growths projecting through the external os. There are a large number of possible causes for abnormal vaginal bleeding. These include cervical ectropion or cancer, sexually transmitted infections, fibroids, endometritis and pregnancy-related bleeding. If a polypoid lesion has been visualised within the cervix, the alternative diagnosis in an endometrial polyp – which could be projecting through cervical canal. Fig 2 – A vascularised haemorrhagic mass protruding through the external cervical os. This is a giant endometrial polyp. Cervical smear – to rule out cervical intraepithelial neoplasia (CIN). Sometimes the polyp can prevent the smear being taken, in which case the smear should be repeated after the polyp has been removed. In approximately 27% of women with cervical polyps, there are also associated endometrial polyps. This is particularly the case in the post-menopausal age group. If symptoms of bleeding persist after removal of the polyp, an ultrasound scan should be arranged to assess the endometrial cavity. Cervical polyps have a small (less than 0.5%) risk of malignant transformation – and so it is common practice to remove them whenever they are identified (even if asymptomatic). 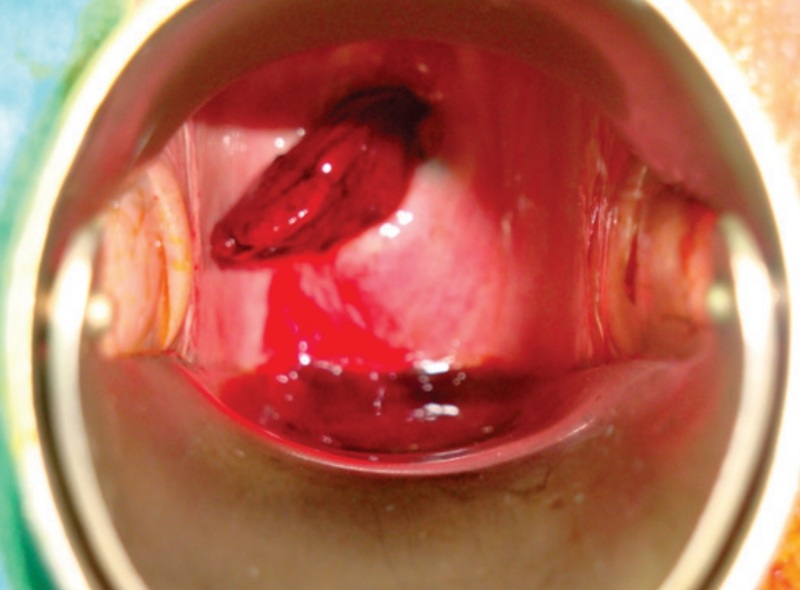 Small polyps can be removed in the primary care setting. The polyp is grasped with polypectomy forceps, and twisted several times. The polyp is avulsed as the pedicle becomes twisted. The polyp should not be pulled off as it will result in more bleeding. Any resulting bleeding can be cauterised with silver nitrite. Larger polyps, or those that are more difficult to access can be removed by diathermy loop excision in the colposcopy clinic, or under general anaesthesia if the base of the polyp is broad. Any excised polyps should be sent for histological examination to exclude malignancy. They have a recurrence rate of 6-12%. Uterine perforation (very rare) – to reduce this risk only polyps that are visible easily should be removed in the outpatient setting. You should not blindly attempt to remove polyps from within the cervical canal or that are intrauterine in this setting. What is the epithelial lining of the endocervix? Which of the following is a common symptom of a cervical polyp? What is the definitive diagnosis for a cervical polyp? Why are cervical polyps routinely removed, even if asymptomatic? Which of the following is a complication of polypectomy?